The AirTanker A330-200 MRTT has been selected as the UK's Future Strategic Tanker Aircraft (FSTA). 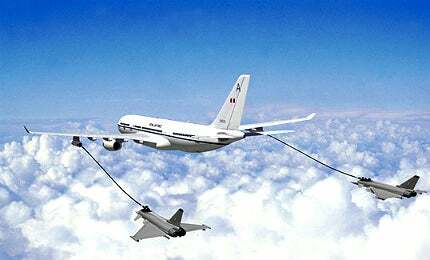 The A330-200 MRTT aircraft will replace the RAF's fleet of 26 VC-10 and Tristar tanker aircraft. The FSTA programme represents the world's largest defence Private Financing Initiative (PFI) arrangement. The high fuel capacity of 139,090l or 111t enables the aircraft to fly at longer ranges, stay on station longer and refuel more aircraft. In January 2004, the UK Ministry of Defence (MoD) announced the selection of the AirTanker consortium under a private finance initiative arrangement to provide air-to-air refuelling services for the UK’s Army, Navy and Air Force. The tanker transporters will replace the RAF’s fleet of 26 VC-10 and Tristar tanker aircraft which are approaching the end of their operational life. The MoD air-to-air refuelling programme will cover a 27-year service period and represents the world’s largest defence private financing initiative arrangement. The contract includes options to extend the service for a further period. The programme is known as the future strategic tanker aircraft (FSTA) programme. In February 2005, AirTanker was confirmed as preferred bidder for the FSTA. In June 2007, the UK MoD approved the private finance initiative (PFI) for 14 A330-200 tankers, under which AirTanker will own and support the aircraft while the RAF will fly the aircraft and have total operational control. In March 2008, the UK MoD placed a 27-year contract for the 14 aircraft. The maiden flight of the RAF’s first A330-200 was completed in September 2010. The second aircraft took off on its first flight in October 2010. The first A330-200 MRTT entered service in June 2011. The AirTanker consortium is led by EADS with a 40% share. It also includes Cobham (13.33%), Rolls-Royce (20%), Thales (13.33%) and VT Aerospace (13.33%). The consortium will convert and own the A330-200 multirole tanker transporter (MRTT) aircraft. The consortium is responsible for certifying and maintaining the aircraft and also for the provision of crew training for the RAF and the provision of sponsored reservist aircrews to supplement the RAF crew when required. "The tanker transporters will replace the RAF’s fleet of 26 VC-10 and Tristar tanker aircraft." In April 2004, Australia also selected the A330-200 MRTT for the AIR 5402 requirement for five aircraft. The MRTT, designated the KC-30B, replaces Australia’s Boeing 707 tanker transporters. In June 2006, Airbus delivered the first A330 platform to EADS CASA in Madrid for conversion. First flight of the KC-30B for Australia was in June 2007. The first two A330-200 MRTT aircraft were delivered to Royal Australian Air Force (RAAF) in June 2011. The fifth and final aircraft was handed over to RAAF Base Amberley in December 2012. The RAAF A330-200 MRTT achieved initial operational capability (IOC) in February 2013. In February 2007, the A330 MRTT was selected by the UAE. The contract to procure three A330-200 MRTT aircraft was placed in February 2008. The first aircraft accomplished its maiden flight in April 2011. It was delivered to the UAE Air Force in February 2013. UAE received the second and third A330 MRTT aircraft from Airbus Military in May and August 2013, respectively. In January 2008, Saudi Arabia placed an order for three A330 MRTT aircraft. The aircraft are fitted with the EADS air refuelling boom system (ARBS) and hose and drogue refuelling pods. A further three A330 MRTT aircraft were ordered by the Saudi Ministry of Defence and Aviation in July 2009, bringing the orders to six. The first A330-200 MRTT of the Royal Saudi Air Force (RSAF) completed its maiden flight in March 2011. The first batch of three aircraft was delivered by early 2013. The A330 MRTT aircraft formally entered into service with the RSAF in February 2013. The first two aircraft of the second batch were delivered in 2014. The sixth and final A330 MRTT was delivered in June 2015. In February 2008, the KC-30 (since re-designated the KC-45), a tanker based on the A330, was chosen for the US Air Force KC-X next-generation tanker requirement to replace the KC-135. Northrop Grumman led the KC-30 team, with EADS as a major subcontractor. An appeal by competitor Boeing was upheld and in September 2008, the US Department of Defense cancelled the competition. In January 2013, Airbus Military was selected as a preferred bidder by the Indian Government to supply six A330 MRTT aircraft for the Indian Air Force. The French Defence Procurement Agency (DGA) placed a firm order for eight A330 MRTTs in December 2015. The first aircraft is scheduled to be delivered in 2018. The company AirTanker Services will operate and maintain the fleet of A330-200 MRTT aircraft. VT Group, the support services integrator, will be based at RAF Brize Norton. On military operations the aircraft will be flown by Royal Air Force aircrew. When not in military service, the aircraft can be leased for commercial use and operated by civilian aircrew. It is envisaged that the fleet will be managed in three groups. The majority will be in full time military service with the RAF. Another group will be in military service during the weekdays, switching to commercial use at the weekend, and the other aircraft will be in full-time commercial use but available to the RAF in times of crisis. The standard A330-200 commercial aircraft is being built at the Airbus manufacturing centre at Toulouse. The aircraft was transferred to Cobham manufacturing facilities at Bournemouth International Airport, UK, in September 2011, for conversion to the tanker transporter variant and aircraft certification was carried out by QinetiQ at Boscombe Down in the same month. "The first A330-200 MRTT entered service in June 2011." All the aircraft will be capable of being fitted with two Cobham FRL 900E Mark 32B refuelling pods, one under each wing. Some aircraft will receive a third centreline underbelly refuelling system. The A330-200 wing shares the same design structure, including the strengthened mounting points, as that of the four-engine A340 aircraft. The wing positions for mounting the air-to-air refuelling pods therefore require minimal modification. The aircraft’s fuel system includes the installation of additional pipework and controls. The baseline commercial aircraft uses a configuration of very high-capacity fuel tanks in the wings so modifications to the fuel tanks for the tanker transporter role are not required. Other than the refuelling systems, the main areas of modification are the installation of plug-in and removable military avionics, military communications and a defensive aids suite. The military systems will be removed when the aircraft is in commercial non-military use. The passenger cabin and the cargo compartment are not altered. The lower deck cargo compartment can hold six 88in x 108in Nato standard pallets plus two LD3 containers. The civil cargo load could be 28 LD3 containers or eight 96in × 125in pallets plus two LD3 containers. The A330-200 MRTT has a sufficiently high cruise speed and large internal fuel capacity to fly 4,000km, refuel six fighter aircraft en-route and carry 43t of non-fuel cargo. Similarly, the aircraft could give away 68t of fuel during two hours on station at a range of 1,000nm. The aircraft has a maximum fuel capacity of 139,090l, or 111t. The high fuel capacity enables the aircraft to fly at longer ranges, to stay on station longer and refuel more aircraft, which increases the basing options and reduces forces reliance on host nation support. For the UK requirement the aircraft is fitted with a hose and drogue system, but is fitted with a refuelling boom system for the Australian order. Cobham is providing the air refuelling equipment, including the 905E wing pods and a fuselage refuelling unit. Cobham also supplies antennae, cockpit control systems, oxygen and fuel system units and composite components for all Airbus A330 aircraft. The QinetiQ AirTanker support team carried out an air refuelling trial of the A330-200 aircraft on 28 October 2003. The test involved assessing the handling qualities of the Tornado aircraft flown in a number of representative refuelling positions astern the wing and centreline refuelling stations. The two-hour flight test included various approaches to the refuelling positions and exploring displacements vertically and laterally from the normal refuelling position. The trial was carried out between 15,000ft and 20,000ft and at 280kt, which is the middle of the Tornado’s refuelling envelope. Within this test envelope there was minimum turbulence in the airflow astern the A330-200 and the Tornado’s handling qualities were very satisfactory in all tested positions. "The first A330-200 MRTT of the Royal Saudi Air Force completed its maiden flight in March 2011." The flight deck of the A330 is similar to that of the A340. The tanker transporter aircraft cockpit has a refuelling officer’s station behind the pilot and co-pilot seats. The electronic flight information system has six large interchangeable displays with duplicated primary flight and navigation displays (PFD and ND) and electronic centralised aircraft monitors (ECAM). The pilot and co-pilot positions have sidestick controllers and rudder pedals. The aircraft is equipped with an Airbus future navigation system (FANS-A), including a Honeywell flight management system and Smiths digital control and display system. The fly-by-wire computer suite includes three flight control primary computers and two flight control secondary computers, all operating continuously. UK tankers are being fitted with the Northrop Grumman large aircraft infra-red countermeasures system (LAIRCM). Even with a full fuel load, the aircraft has the capacity to carry 43t of cargo. The aircraft can carry up to 380 passengers. The aircraft for the UK are powered by two Rolls-Royce Trent 772B jet engines, each providing 71,100lb of thrust. The aircraft for Australia are powered by GE CF6-80E1 engines, rated at 72,000lb thrust. The auxiliary power unit is a Hamilton Sundstrand GTCP 331-350C. The main four-wheel bogie landing gear, the fuselage centre line twin-wheel auxiliary gear and the twin wheel nose units are fitted with Goodyear tyres. The runway length for maximum take-off weight is 2,650m and the ground turning radius is 43.6m. The Airbus Industrie A310 MRTT is a wide-bodied multirole tanker transport aircraft derived from the Airbus A310-300 civil passenger and transport aircraft. The Boeing 767 tanker transport aircraft, designated KC-767 for the US Air Force, is a high-performance version of the Boeing 767-200ER twin-aisle jetliner equipped for fully integrated tanker operations. It is fitted with boom and receptacle refuelling, hose and drogue refuelling, or both.